I love that famous line in that fabulous movie. I love to watch it because of those endless summer skies, especially at dusk. This month, I went home. Not to my childhood house, my home town, but home to Iowa. I love my state. It has so much to offer, such wonderful people, and we entertained ourselves for days without shopping malls, tourist attractions or chain restaurants. My sister Patti lives on a farm outside of Waterloo, IA, so my Los Angeles sister Lori and I flew in to Minneapolis and Patti came and got us. There is the first caveat of Iowa. It's not terribly easy or cheap to fly to the tiny little airports, but Minneapolis is just a 3 hour skip through God's country. A little background, we grew up in Clinton, Iowa and I went to high school in Davenport, Iowa. Most of us graduated from University of Iowa, and my sister Patti, brother Paul and mother-in-law Darlene still live in Iowa, albeit very far from one another. Just over a year ago on Memorial Day, Patti lost her beautiful farm house, barn and shed to an F-5 tornado. Tragic on many levels. The house was just 8 years old, it had been rebuilt after the 1st tornado wiped it off the map just 4 years after she built it. So, third times a charm. The new and improved house is gorgeous. Much prettier than either of its former selves. On our first morning, we went to an old rail trail for a little exercise and wild black berries. We picked about 4 cups of the little black caps as they call them. The have sharp thorns, and entwine themselves in all the brush, but they are delicious. Patti is planning on adding them to a batch of wine, but more about that in the next blog. The great thing about rail trails is that the foliage surrounding the old rail road tracks was never sprayed so it is loaded with wild black berries, wild grapes and unusual flowers. Lori and I were taken with the mulberries. We had a mulberry tree growing up, and those fat black mulberries brought back great memories. We walked everyday, but after this day, we walked the many gravel roads in the country. In fine Petitti fashion, our days always melded into a fabulous dinner. One night we did an Iowa cookout. We went to Fareway Foods to buy steaks. This is the coolest grocery store ever (sorry Dad). The meat department had no less than 6 butchers in white coats and Fareway caps. Patti bought a huge ribeye and had it cut and wrapped right there. I don't know about where you shop, but most of the people that work in the meat department of my grocery don't know the difference between Prime and Choice, and here is a 2009 store with 6 trained butchers. Mind you, this isn't a mega market, in fact it is hardly bigger than a 7-11. People shop here because they know the meat is fresh. No pre-wrapped meat here. Need I tell you how wonderful they were on the grill? Of course we grilled fresh Iowa corn, straight from Hesse farms, peaches and cream it's called. Grilled in the husks. It was so delicious it didn't need butter, but hey, it does make everything taste better! We also had an Amish excursion. In central Iowa there is a large settlement of Amish and they have embraced the tourism there with shops and restaurants. However, a couple of miles down the rod from Patti is another settlement, no tourism, but interesting to see. We did venture into a few little stores but the real attraction is what goes on outside. Horse power and hard labor is all they use to get the job done. It was a cool day, and we spotted plowing and they were shocking oats. This is where they mound them up into little piles. My brother in law pulled into a beautiful farm and we talked to the grandfather type man, and waved at the adorable little grandson. The farm was really beautiful and home to goats and horses. I shot some great pictures of the workshop and animals. Perhaps the best shot of the day came as we were heading back home. We passed yet another beautiful farm. 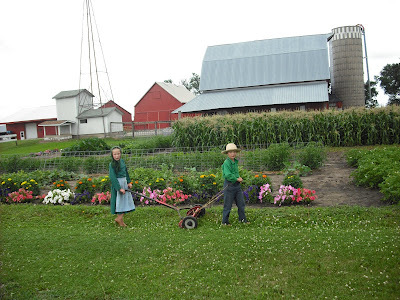 The vegetable gardens are bordered by brilliant flowers, and there were 2 adorable kids "mowing" the small strip of grass between the garden and the road. The little girl was pushing the old hand mower, and the little boy had a rope around his waist pulling. They were both barefoot and are the picture of innocence. The adventure continues in the next blog. We went to an exhibit at the museum on Iowa food, we baked grape pie and we hunted out barn quilts! But most important, we worked in Vito's Vineyard. Stay tuned for pictures and recipes! Yes, I'm still here! The July Daring Bakers' challenge was hosted by Nicole at Sweet Tooth. She chose Chocolate Covered Marshmallow Cookies and Milan Cookies from pastry chef Gale Gand of the Food Network. Now in Memphis, the temperature has dropped to a chilly 82, but the humidity at 10pm last night was 89%. Anyone who loves an egg white like me knows this is no weather to be making marshmallows. And it's sort of a bummer, because I love them. Raw, with Rice Crispies, toasted over a fire, on top of sweet potatoes, I am not choosy. But when it is dripping outside and the sun is shining the little devils get sticky as molasses. So I have opted to make only the Milan Cookies. They look a little like a famous upscale grocery store brand, but as with most things, they taste way better right out of your own oven. There are ways to make variations on this gem, adding mint, almond, rolling the edges in almond, white chocolate filling, really your imagination can go to town. The original recipe calls for orange with the chocolate, but I love dark chocolate and raspberry, and I love Nutella, but sometimes I am a total purist, like today. I chose to use vanilla paste. A wonderful product made by Neilsen Massey, the best name in vanilla to begin with. Vanilla paste is basically all those beans scraped from a pod of vanilla and suspended in a sugar syrup. It gives the bean flecks in vanilla products, and makes these cookies heavenly. I baked on convection, but even still with the humidity, they seemed chewy. So here's the recipe as I followed it. Delicious! As an afterthought...the flavor of the cookies alone with the vanilla paste was divine. However, I had to leave the cookies in the oven all night (not on) to dry them out. Because of the crazy humidity, it was nearly impossible to get a great crunchy cookie out of this recipe. But we decided you could slather chocolate ganache on Milkbones and they'd be yummy! Happy Baking! Yes, Father's Day has passed, but my dad is coming back through Memphis and we decided to celebrate again, and this blog is for him. We had a mini celebration for Scott, which also happened to be Nic's last day before Basic Training began. So no one gets their own day with everyone present and accounted for, but that's okay, life sometimes gets in the way. The photo above is one of my favorites of my men. 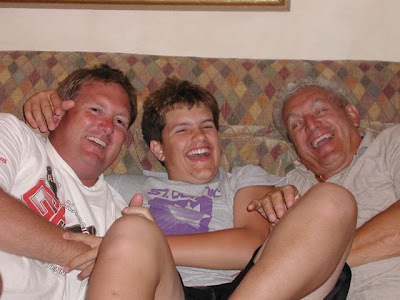 My dad, Scott and Nic, all laughing about something, I wish I knew what it was. But how wonderful that this moment is captured. How often do we really get a good belly laugh? Because Father's Day was also Nic's last day, he had a special request: apple pie. I decided that was the perfect dessert for many reasons. You see apple pie isn't just a pie, it is a memory, a story, a piece of my heritage. Many of you read my Mother's Day tribute, this is the Father's Day tribute. Scott and Nic ate one pie on their day, but the blog tribute comes with a pie for my dad that I made and froze just like he used to do for many summers. Happy Father's Day Dad! Around 1909, Vito Petitti, my Grandfather, was 14 years old and he boarded a ship in Naples, Italy. He was unaccompanied by an adult, and was following a journey his own father had made just a year or so earlier. Sadly, his father was dead, he had been murdered in Cleveland, Ohio. He had made the same passage to America to make a living and send for the family. My Grandfather wasn't willing to let his father's dream of a new life in America die with him. So, as a very young man ( almost a child) he made his passage to New York City. The ship arrived at Ellis Island, where my Grandfather was processed with thousands of immigrants. I am amazed at the information I could find online at Ellis Island and we have searched pages of manifests to determine his exact sailing dates as there were a large number of immigrants from his small town of Faeto, and there are an astounding number of Petittis. Strange, because in my life I can only think of 3 Petitti that I know or have heard of that I wasn't directly related to. He told the story of entering New York to my father. As they arrived at Ellis Island, he was amazed at his new country. There were volunteers all about and they were passing out a small sausage and a small hand pie to the new arrivals. My Grandfather's village in Italy is famous for its pork products, so the sausage was not that interesting, but the pie was unlike anything he had ever seen so he ate that first. How "American" that his first food on this soil was apple pie. It was love at first bite. He quickly traded his sausage with another immigrant for another of those apple pies. So began the family tradition. Many years later my own father, Pasquale Vito Petitti was born in Chicago. His mother was also an immigrant from the same Italian village. My Grandfather owned a grocery in Chicago called North Avenue Food Mart. It was located at 2654 North Avenue in Chicago and he also owned a few meat markets on Taylor or Palina and Cicero and Lake St. 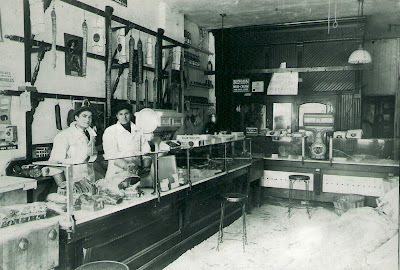 This photo is in the meat market, Grandpa and Uncle Joe. You can't see the sign well, but it reads, "Don't ask for credit". Smart men! In 1941 my Grandfather decided to leave the city and set up a farm. He held on to one of the markets, but established the biggest dairy farm in Kane Co. Illinois. The farm and the grocery are where my dad has his childhood memories. I love looking at the old photos of the grocery store with its neat stacks of cans and hand lettered signs, and the meat market with the men in their white aprons. I have the the box of stamps they used to make the signs with the prices on them. Truly an era gone by. But back to the pie. My Grandpa got more than cows when he moved out to the country. He had gardens and chickens and an orchard, full of apples. Apple pie would become a tradition alongside Sunday gravy and home made wine. In my own childhood years we too had apple trees. Not an orchard, but trees. Now, no offense to you folks in New York or Washington, but in the midwest we don't grow apples with names. They are apple trees plain and simple. And the apples are green and tart and small. You want to get them before the worms do, and you pay the little kids to pick them up off the ground before they rot to a mushy brown and the bees come in. But they do make the best pie! Green apples tend to be a little drier so they really compliment the cinnamon sugar combination, and we make ours with a crumble on top. Yum, as the baker I am privileged to eat a little hunk of that butter, sugar, flour on top as soon as the pie emerges from the oven. My dad would spend an entire summer day making pies. First the crust, made with lard and Crisco, I said they were good, not good for you. And then the endless peeling and slicing. He would make a dozen pies at a time and put them in the freezer. What a treat on a chilly winter day to eat from your own backyard. So Happy Father's Day Dad. Really, it's always father's day. This pie is a great tradition and we are all so proud of the great heritage from which we all came. Bon Appetit!